OOPS, getting back into regular posting mode now. Mostly I have just been lazy and/or thinking about how to start a new Sassy 2.0. Which, my goodness, I have lots of questions and polls to pose and post here before that gets started, but we gotta wait a bit. Spencer took this one. The main focus (especially with TOTES PROFESH Picnik editing) is the color, the beige of the sleeves with the stone of the building, and then the sequins with the shininess of the joke shop glasses and stained glass windows. The green tint of the stones and the tree's blue shadow add to this, too. 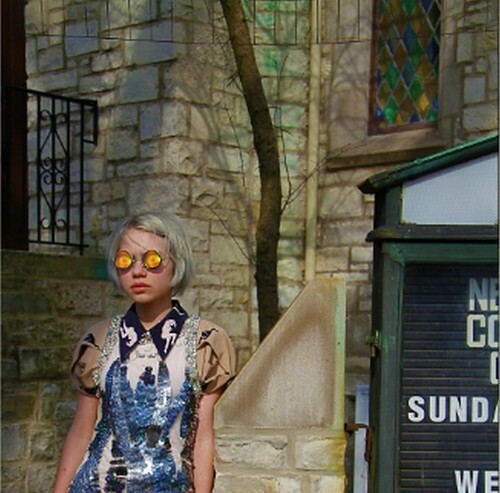 No story here, really, unless you can think of anyone who wears Miu Miu with eyeball glasses outside a church. Besides, uh, me, of course.